GEN200 Control is a proprietary bio-mix of natural micro-elements supplemented with Orthosilicic acid. GEN200 ensures the growth regulation and natural defense-system. This ensures the plant to have better resistance against diseases and distresses such as heat and cold. Your plants will root faster, develop stronger stems and leaves which results in firmer plants and bigger yields. GEN200 can be used on all kinds of soil and with all kinds of nutrition! 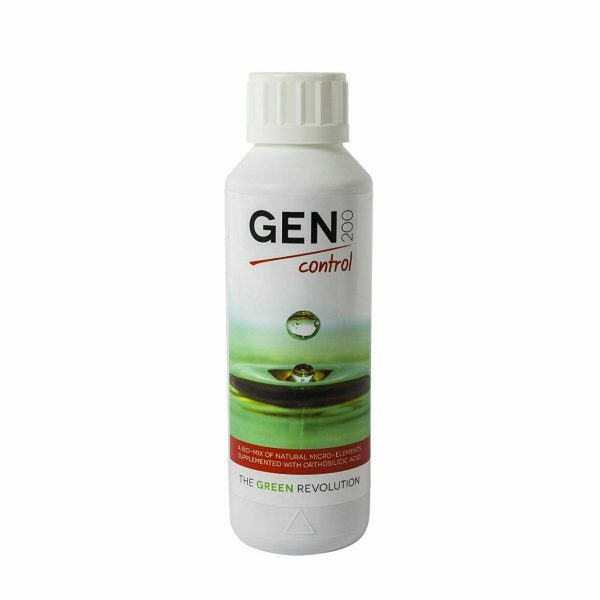 After sprouting or when planting your plants: add 20 ml GEN200 Control on 100 liters of water. During the growth phase: once a week add 20 ml of GEN200 Control on 100 liters of water. During Flowering stage: Once weekly add 20 ml on 100 liters of water until harvest. Always mix GEN200 Control before the nutrition. Shake well before each use. Keep out of the reach of children. Only for specified use on label. Keep at room temperature.